The four oyster DNA samples ( # 100, 2HL 1 – 3) incubated at 60 degree for an hour. Samples were previously stored at -80 degrees. DNA was extracted from them using the mollusc DNA extraction kit. None of the optional steps were performed. Later the samples were stored in refrigerator in box ‘Oly gDNA Oly Reciprocal Transplant Final Sampling Box #2’. This entry was posted in SR lab notebook and tagged #Oly_reciprocal_final_sampling, 2HL, 2SN, DNA_extraction, Fidalgo_Bay on 10 December, 2015 by . The six oyster DNA samples ( # 94 – 99) incubated at 60 degree for an hour. Samples were previously stored at -80 degrees. This entry was posted in SR lab notebook and tagged #Oly_reciprocal_final_sampling, 2SN, DNA_extraction, Fidalgo_Bay on 20 November, 2015 by . The six oyster DNA samples ( # 88 – 93) incubated at 60 degree for an hour. Samples were previously stored at -80 degrees. This entry was posted in SR lab notebook and tagged #Oly_reciprocal_final_sampling, 2SN, DNA_extraction, Fidalgo_Bay on 19 November, 2015 by . The six oyster DNA samples ( # 82 – 87) incubated at 60 degree for an hour. Samples were previously stored at -80 degrees. The six oyster DNA samples ( #76 – 81) incubated at 60 degree for an hour. Samples were previously stored at -80 degrees. 1) Centrifuge the sample before adding isopropylalcohol to settle down the tissue. Take only the liquid for rest of the protocol – Didn’t work since tissue and liquid did not separate. Later the samples were stored in refrigerator in box ‘Oly gDNA Oly Reciprocal Transplant Final Sampling Box 1’. This entry was posted in SR lab notebook and tagged #Oly_reciprocal_final_sampling, 2SN, DNA_extraction, Fidalgo_Bay on 14 November, 2015 by . The eight oyster DNA samples ( #68 – 75) incubated at 60 degree. Samples were previously stored at -80 degrees. Later the samples were stored in refrigerator in box ‘Oly gDNA Oly Reciprocal Transplant Final Sampling’. This entry was posted in SR lab notebook and tagged #Oly_reciprocal_final_sampling, 2SN, DNA_extraction, Fidalgo_Bay on 11 November, 2015 by . 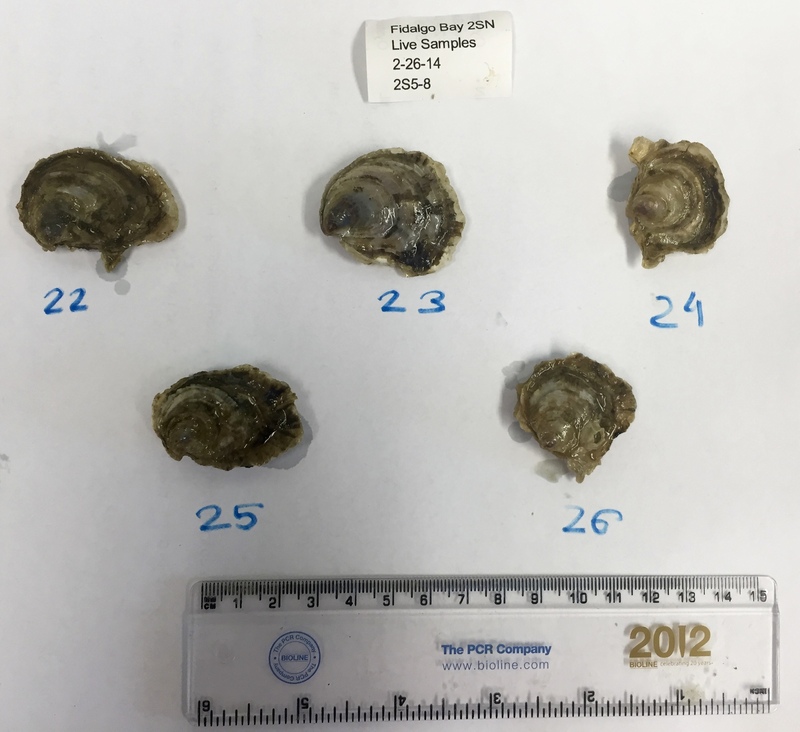 The six oyster DNA samples ( #27 – 31) incubated yesterday (10/28/2015) were taken out. This entry was posted in SR lab notebook and tagged #Oly_reciprocal_final_sampling, 2SN, DNA_extraction, Fidalgo_Bay on 30 October, 2015 by . 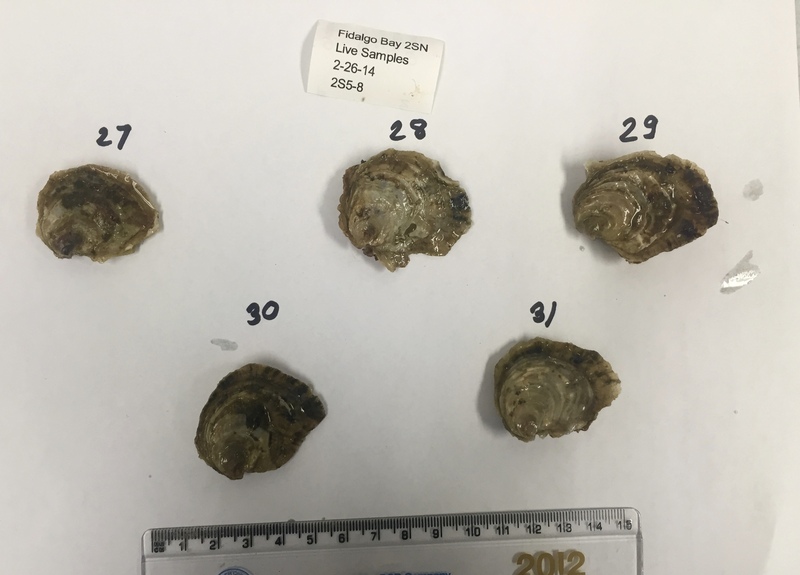 The six oyster DNA samples ( #22-26) incubated yesterday (10/27/2015) were taken out. DNA was extracted from them using the mollusc DNA extraction kit. All the optional steps were excluded. Took out 6 oysters from Fidalgo Bay population for DNA extraction. I collected gill tissue from oysters #27 – 31 for DNA extraction. Gill tissues of all oyster were collected in MBL 1 buffer and proteinase K for DNA isolation by mollusc kit. Placed all the tubes with gill tissues in 37 C for overnight. Viscera with digestive glands and gonads, etc. were dissected and discarded to prevent decomposition of rest of body by enzymes. Rest of the body of each oyster was stored in 10X RNAlater solution by weight. Took out 5 oysters from Fidalgo Bay population for DNA extraction. I collected gill tissue from oysters #22 – 26 for DNA extraction. 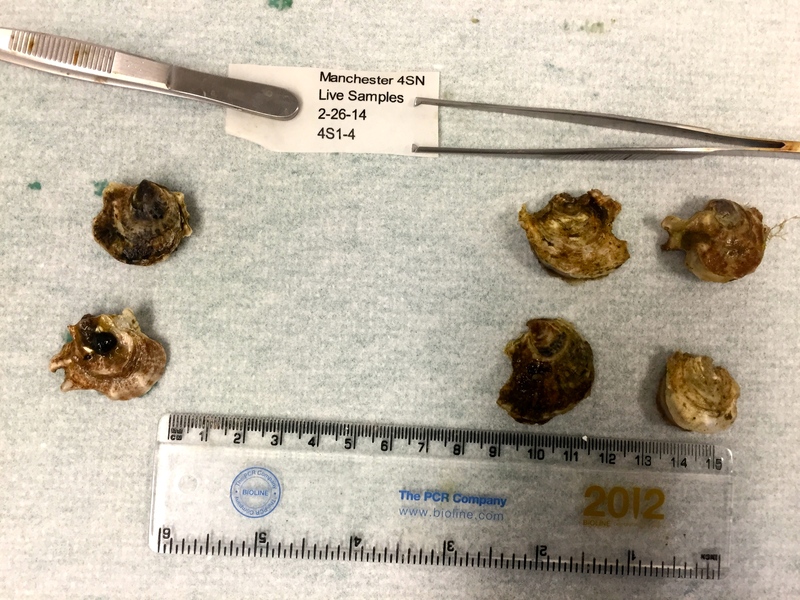 Took 6 oysters from 4SN population collected at Manchester for DNA extraction —> Found all dead. We have weighed and photo documented them for length/width measurements. Took two oysters randomly from 2SN population collected at Fidalgo bay (and they were both alive.). Weighed and photo documented them for length/width measurements. I learned how to open oysters, separate the gill tissue for DNA extraction, and putting specific parts in RNAlater. Stored gill tissue for ~ 5 hours in buffer at 60 C.
Later used DNA extraction kit to extract DNA from both samples. Stored in freezer for further process. This entry was posted in SR lab notebook and tagged 2SN, DNA_extraction, Fidalgo_Bay on 14 October, 2015 by .